The FocOz inventor is here! FocOz is the newly registered trade mark for this novel 'Infinite Depth of Field' camera and technology. So what does it stand for? People who have personally seen a FocOz camera in action, and watched the results popping up in the computer after a couple of minutes processing, are apt to be impressed. But we are now on the web and frankly speaking: Who is prepared to spend lots of money on basis of web information about a virtually unknown camera with features which appear to be taken from the far off lands of Alice in Wonderland or the Wizard of Oz? Well, the web is after all a cost effective way for quickly bringing out this news to you - professional photographers who - no doubt - quickly realize the potential to produce hitherto 'impossible' and thus profitable photos with a FocOz camera. Like this F/2.8 telephoto-shot of Mexican figures at widely different ranges. And those of you who decide to buy from the first available production in 2004 may also benefit from publishing the first FocOz pictures. So how well does it work? We have been careful, not to tell just about the good news, but also hint about inherent limitations of a FocOz system. But even so, being an old-time photographer, I'm succeeding most of the time with my FocOz camera, having discovered vast fields of good use and new applications throughout these last few years, testing the concept. I only wish I had more time doing so, because it's lots of fun! We do however hope you enjoy some of the FocOz test-shots made by me and my colleagues: Press the Photo Gallery button for a FocOz roundtrip in Norway. These adjacent pictures are shown without retouch as they left the computer! You could also be one of the new FocOz explorers of the world! Assuming these visible results are approved by you, your next question may well be: Is our company Scandinavian Nighvision AB a quality producer to be trusted, delivering in time? 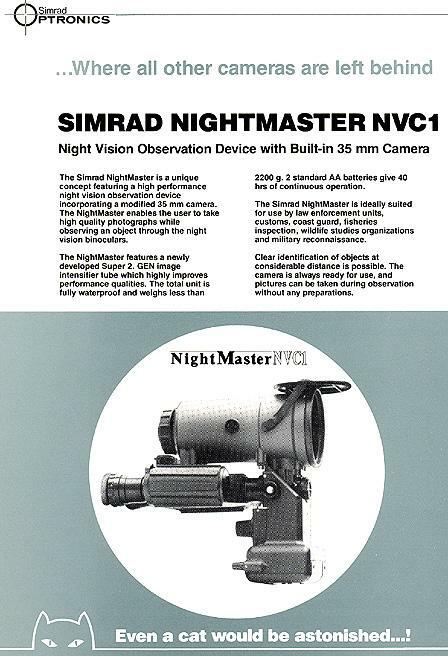 It might help if I tell you a little about our past: Scandinavian Nightvision was started by me in the 1980's and has been inventing, developing, marketing and producing high tech image intensifier nightvision instruments for the domestic Scandinavian and international market for almost 20 years. I think I may say without risk, that our quality standards and deliveries have been flawless throughout this period. And we have produced thousands of sophisticated night vision cameras, goggles, observation devices, sights and even night vision TV-systems (all in-house optical designs) for special forces in Sweden and US to mention a couple. Military products are facing very severe conditions: Our GN-1 night vision goggles for example, can be submerged in water for hours, several meters deep and then shaken in a machine for hours at various temperatures and still work after that. It does not mean that a FocOz camera can cope with all that - it wouldn't be cost effective for you or us. But it sets a kind of quality standard and policy for our company and activities. The other references I can offer you, are the two PCT patents, published in English, where the technical background of a FocOz camera is revealed for you. The first one with PCT number WO 02/059692 A1 (40 pages, 21 claims) was published in 1 August 2002 and deals mainly with the basic aspects plus some image processing techniques being involved. The second one with PCT number WO 03/067323 A1 (33 pages, 32 claims) was published in 14 August 2003 and is mainly dealing with constructional aspects of an 'Infinite Depth of Field' camera. You may also find other inventions we've patented (being used in various products) under my name. 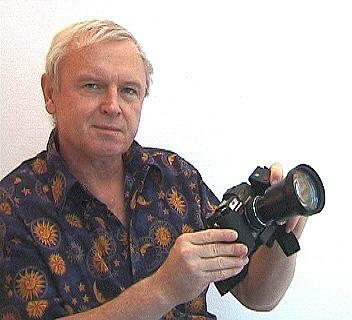 The first electronic image stabilizer for example was one of them (Patent SE 461 426 applied for in 1983). Please press the How to Order button for further details about ordering a FocOz camera. I welcome you to be one of the pioneers, discovering the new wonderland of FocOz.